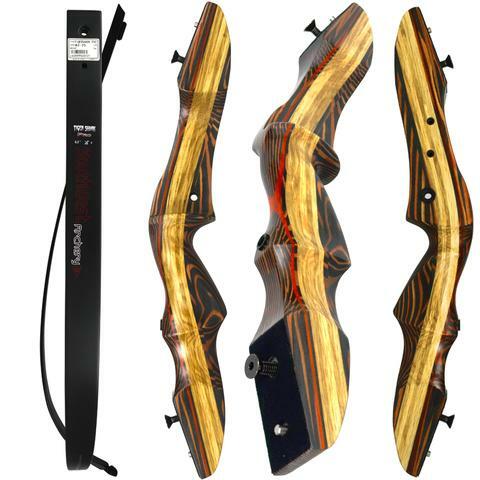 If you’re looking for a versatile recurve bow, and also a model that comes with positive feedback from users, the Tigershark from Southwest Archery is an option you should consider. Made by a company that employs essential upgrades to its designs on a regular basis, the Tigershark is a reliable and durable option. Also, seeing that it comes with an arrow set, it is already a good deal for a beginner who just wants to learn how to shoot. That said, you can pick this bow for hunting, too, and you will be pleased with its overall performance. The decent price tag contributes to its appeal, as well. An improvement over the Samick Sage, one of the company’s best known recurve bows, the Tigershark is an example of how a durable model should look like. The limbs are made from naturally sourced woods, which means that the manufacturer also cares about harvesting its materials from sustainable forests. The limb tips are reinforced, which means that you can expect excellent durability from this product. That also means that the model is compatible with both Fast Flight and Flemish strings, a plus for those who will want to upgrade their bows by replacing this particular element. One of the first things we should say is that this model is available in both right-handed and left-handed configurations, which means that you will not have a problem finding one that fits. This bow is lightweight and compact, so you will have no issues with storing it away when not in use. Also, carrying it along with you for hunting or target practice won’t take a toll on your arms, and you will be able to shoot it as many times as you want. 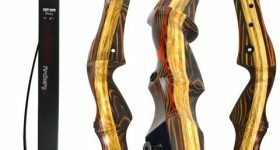 The beautiful satin finish adds to its appeal and proves, once more, the manufacturer’s care for creating recurve bows that will make an impact. With more than two decades of experience in making these bows, the company surely wants to get more shooters onboard with its products, and the Tigershark is just another example of the improved craftsmanship it employs. There are quite a few features that we must talk about. For instance, the Pin-Locking technology used for the PRO version ensures that the limb placement will be a contributing factor to your increased precision. The 62 inches in length offer the possibility for tall archers to try this model. You will find it available in various draw weights that vary between 25lbs and 60lbs, using 5lbs increments. It is quite clear that the manufacturer wants this bow to appeal to a wide range of shooters. Another thing you will like about this model is that it comes with pre-installed bushings for adding extras, such as plungers, stabilizers, sights, or reels for bowfishing. As expected, this feature adds versatility to the bow, as you can customize it as you see fit. A Dacron string will be included with your purchase, as well as a set of arrows, which means that you will be able to start shooting as soon as the bow is delivered to your door. The manufacturer will supply a stringer tool in case you don’t have one. Just make sure that you check the needed boxes when you place your order so that you can have it delivered with the rest of the package. As this is a takedown bow, that also means that it is portable, and you can have it with you on hunting trips, without burdening yourself. You will not hear any complaints from users regarding such issues when it comes to this takedown bow. Seeing that it is versatile and that it can be used in practice, as well as hunting, you will want to know if it is silent enough to help you remain concealed while stalking your prey. You won’t have such worries when you’re using this bow, and you will manage to stay silent throughout your hunting experience. The Tigershark is a model made with the needs of many in mind. It comes complete with an arrow set, to ensure that you will be able to start using it, right out of the box. Its overall construction is durable, and you will not be left disappointed by its precision, either. A takedown model, it can be assembled and disassembled, as needed, an aspect that makes it portable and compact. Overall, it is a good option for beginners.